We were retained by the refinery’s environmental consultant to install a 4″ in-well pneumatic pump, specialized wellhead, and temporary liquids and compressed air hoses to evaluate product recovery from a 4″ recovery well in an active area of the refinery. Recovered fluids were routed to an oil/water separator rental unit and discharged to a refinery API separator. The scope of our work included equipment procurement, placement, and system start-up. Following the successful implementation of the pilot study, we were retained to prepare P&ID drawings for the design of steel liquids and compressed air pipe works for a 5-well recovery system. 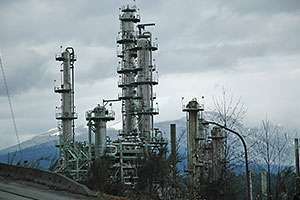 The materials and pipeworks specifications had to meet strict refinery safety requirements. 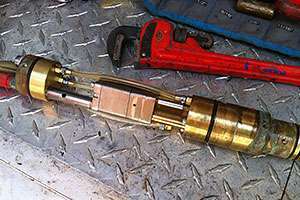 We installed 4” inch pneumatic pumps in each of four new recovery wells and connected each of the five recovery wells to the steel pipe works installed by refinery personnel based on McCue designs. All proposed and completed construction works were inspected by engineering and operations refinery personnel prior to system start-up. The installation passed without modification and the system was started. We continue to conduct ongoing maintenance and monitoring of this system on an “on demand” basis. This commitment requires that we have our employees up to speed on the refinery’s Health & Safety Program, with re-education on an annual basis. Based on the success of the existing hydraulic barrier, we were retained by the refinery’s environmental consultant to install an extension of the hydraulic barrier, effectively tripling the size of the barrier. Our team supplied and installed pumps, fittings, and custom built wellheads.